Every year, I try to make a football-themed dish for our friend's Super Bowl party. Sometimes the dish looks like footballs, other times they pay homage to one or more of the teams. This year cried out for a dented football. My initial inclination was to make chocolate peanut butter eggs, molded to look like a dented football. Then I was feeling under the weather and just didn't have the energy with molding and dipping individual footballs. I happened upon a version of this dip on Facebook -- it didn't attribute the original author so I have no way of crediting whoever came up with the idea. The dip itself was easy to mix together, but the end result was a far cry from the picture I saw on Facebook. 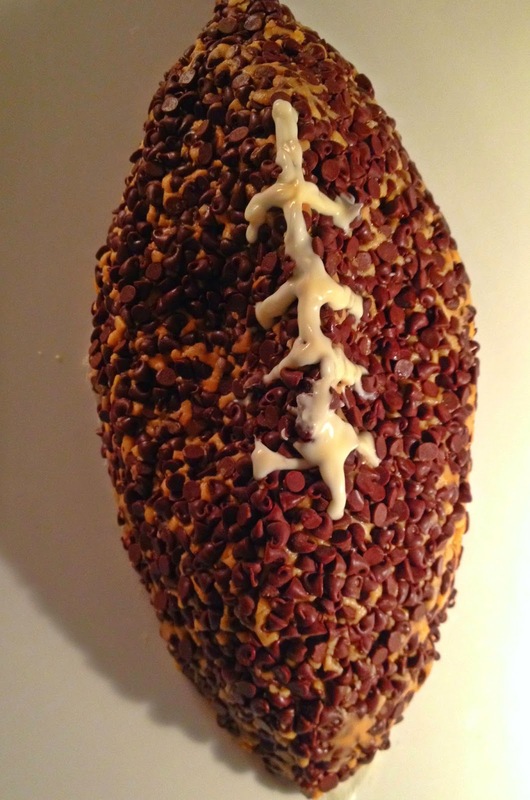 I can't imagine how anyone could fully cover the football with mini chocolate chips (or jimmies in the original photo, but they taste like wax and look like mouse poop). Also, the white chocolate I piped didn't stick right to the irregular surface. It's hard to see the dents in the football, but they are on either side of the white laces, because that's how my husband told me a football deflates. Anyhoo, I wasn't going to post about this homely creation, especially because I didn't feel good enough to go to the party. But when my husband put all of the dippers -- animal crackers and pretzel sticks -- around it, people pounced so quickly that he couldn't take a shot of the completed platter for me. So I thought I'd post the recipe. In the future, I wouldn't bother molding it -- I'd serve it in a bowl and garnish with mini chocolate chips. Mix butter, cream cheese, peanut butter and vanilla until mixed. Add powdered sugar, ½ cup at a time, and mix until combined. Mix in chocolate chips. Turn out mixture on a large sheet of waxed paper. Use your hands to form into a football shape. Place the waxed paper onto your serving plate. Put a little dollop of peanut butter under the wax paper so it doesn’t move around. Cover in sprinkles or chocolate chips, pressing them into the surface a little so they stick. They will not cover completely unless you want to spend hours on this. Once done, trim around the wax paper. Pipe on the laces using melted white chocolate or a bit of white frosting. Chill until ready to serve. Serve with pretzels, animal crackers, cookies or graham crackers.